Photograph by Michael Mathews/The Guardian. Members of Wright State’s Engineers Without Borders (EWB) plan to travel to Uganda in March. EWB completes community service projects based on engineering principles, according to Jacquelyn Smith, EWB president. 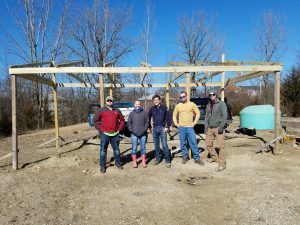 “(We’re) trying to better communities through the development and implementation of various engineering-based community service projects,” Smith said. EWB members will be in Uganda for about eight days. During that time, they will observe and gather information about the sanitation system and practices at St. Takita Secondary School. The members will then return to the United States to design a new sanitation system for the school. They will return to Uganda to implement their plan during winter break of 2019. EWB has also undertaken several home service projects in the Dayton area. Recent projects include a rain collection system for The Word Pentecostal Church in Trotwood and a wetland observation deck in Beavercreek. Smith said that the Uganda project will be different, but EWB is prepared for the challenge.